Thanks, now I can join the wild hunt myself through Odhinn. Thank you for even considering to share this, I will wait for when you are ready to share and of course free from your activities, infinite blessings brother. 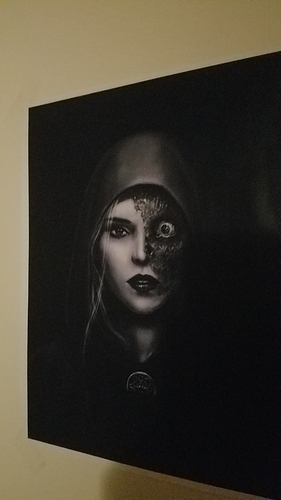 I don’t care what anybody says about Hel, I think she’s beautiful. Oh man that’s awesome. I spend my entire work week in those areas. Defintely doing this. Thanks for posting. So the Hunt has officially began. Tonight I was planning on performing the Alfablot ceremony but I heard sprectral ravens and warhorns and it snowed when I awoke, so I suppose that was my cue to join the Hunt. I began my ritual by hailing Draugadröttin (Odhinn’s role as the leader of the Hunt and Lord of Ghosts), hailing Wodanaz (Odhinn’s role as the Furious One), hailing the spirits of the Ulfhednar and Berserkir, and by hailing the Wolf Spirit within myself. I worked myself into a frenzy and cast several Rune curses before I used the power of the runes to call upon the force of the hunt. I laid down on the floor in my ritual circle and felt my body tingle. I used soul travel to ascend through the ceiling and join the Horde of Ghosts, elves, and sprectral wolves and ravens. The Hunt was wild and unpredictable but my intention directed it to the home of an enemy. This happens on its own when you join the hunt with an intention. The Hunt swarmed the house, attacking anything and anyone in sight with primal fury. Spears were thrown, arrows were shot, and claws tore at the subtle bodies of the people there. When you join the hunt, you are overtaken with a mindless bloodlust that is liberating and terrifying at the same time. After spiritually decimating my enemy, the Hunt carried on as usual, proceeding across the night sky, with occasional mortals being attacked or torn from their peaceful dreams to join us. Draugadrottin led the hunt and as the Hunt thundered across the night sky, I felt my mind returning to me and I returned to my body. Odin himself works with giants so whoever told you that story has a lack of understanding of Odin. I agree with @FraterMagni this sounds sketchy at best. Hell in my own case i am working out a ritual from insights given to me in meditations with a vedic deity the system of which i was lead to by the divs so the various entites from my experiences at least are not too worried about who we work with if it is part of our path. this is normally a human agenda and concern from what i have seen. You may wanna study up more on the myths. Odin doesn’t have any particular issues with all gaints. Hell in more than one he takes a gaintess as a lover. Along with the gods “party hall” basically being hosted by a sea giant regularly according to the lore. not sure why the Christian references though. There is a difference to true myth and a fabricated story. True myth has spritual lessons that can be applied practically becoming a part of our reality through experience. The manmade and imperial edited bible and it’s stories are not myth. Those that follow that cult treat it as fact and history. Which is a large part of why it is so destructive. It’s the same with the torah the religion was originally not a monotheistic one but was altered for polatical agendas. The entire idea of “hell” was stolen from the concept and myths of hel/helheim ruled by the goddess hel of the norse underworld. Actuallly the ideas of hell were in the hands of monotheistic cults centuries before the author of this was ever conceived again taking from polytheistic tradtions idea of the underworld and twisted. When this specific cult was turned into an agenda of imperial expansion to wipe out the tribes that worshipped these gods and others. They also twisted and or demonized the things in their tradition. For example there is a Zoroastrian text ARDA VIRAF written some time around the Sasanian Empire (224 to 651AD) is a tour of the zoroastian heaven and hell(arezura). Easter connected linguistically to a indo-European goddess of the dawn. Christmas - traditions connected european ancestor worship. If you wanna dig more into what the various cults of monotheism have taken or tried to erase from the mind one good way is too follow the language as i am learning. As well as anything connected to damnation, the devil or the cults idea of evil with worshiping other gods. The whole core agenda of these monotheistic religious cults is to kill actual spiritual traditions, expand territory and convert or kill whoever doesn’t convert. If ya wanna find the real power see what they tried to get rid of in their devil and demons. This is a pretty common practice in most lhp practices and for good reason. That is because the whole concept of hell these monotheistic cults have is a mental construct twisted from the concept of the underworld. I know very well the definition of what a cult is thank you. BITE model is new though thanks but it fits i am curious why you are tryin to take pot shots at my intelligence though. i noticed you cherry picked from among the various definitions using your own intellect.